Ideal for outdoor work in harsh environments, the Marigold Industrial Viz PF Insulator Gloves feature a hi-viz design with a thermal lining to protect you from the elements. Providing excellent wet and dry grip, and featuring a breathable open back to reduce the build up of perspiration, these gloves are ideal for a range of general handling applications. The Viz PF Insulator Gloves are designated Category II gloves, meaning they are suitable for medium-duty tasks and intermediate levels of risk. 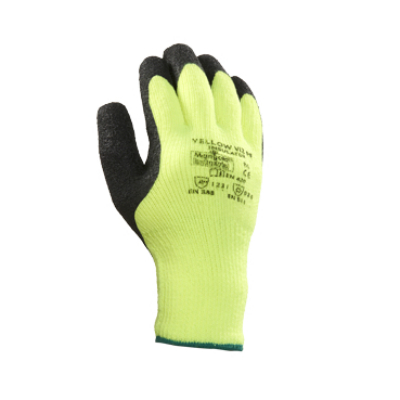 The Viz PF Insulator Gloves are supplied in four different sizes. Please measure the circumference of your hand around the knuckles (excluding the thumb) with your hand open and your fingers together, and the length of your hand from the tip of your middle finger to your wrist. The Viz PF Insulator gloves are designed to have a close fit in order to enable precise handling.